I almost called this post “Everybody loves @norm” after the popular former Deputy Mayor, Norm Kelly, who represents Ward 40 on Toronto City Council. In this latest installment of my (nearly complete) series of posts on the results of the 2014 municipal election, I come to Wards 39 and 40, Scarborough-Agincourt. The provincial/federal riding of Scarborough-Agincourt is a nice rectangular shape, bounded by Steeles Avenue to the north, Ellesmere Road to the south, Victoria Park to the west, and the GO Transit Stouffville corridor (formerly the CN Uxbridge Subdivision) railway to the east. This rail corridor is proposed as the route of Mayor John Tory’s “SmartTrack” transit plan. However, the boundary between Wards 39 and 40 is a bit jagged, with Finch and Birchmount Avenues and West Highland Creek forming the boundary. This results in an odd panhandle in Ward 39, as it includes only two apartment towers south of Sheppard Avenue. In the mayoral race, Doug Ford came in first place in both wards, netting 50.1% of the vote in Ward 39 and 48.4% in Ward 40. John Tory came in a distant second place in both wards, with 26.9% of the vote in Ward 39 and 30.7% in Ward 30. Third-place Olivia Chow got between 17 and 18% in both wards. 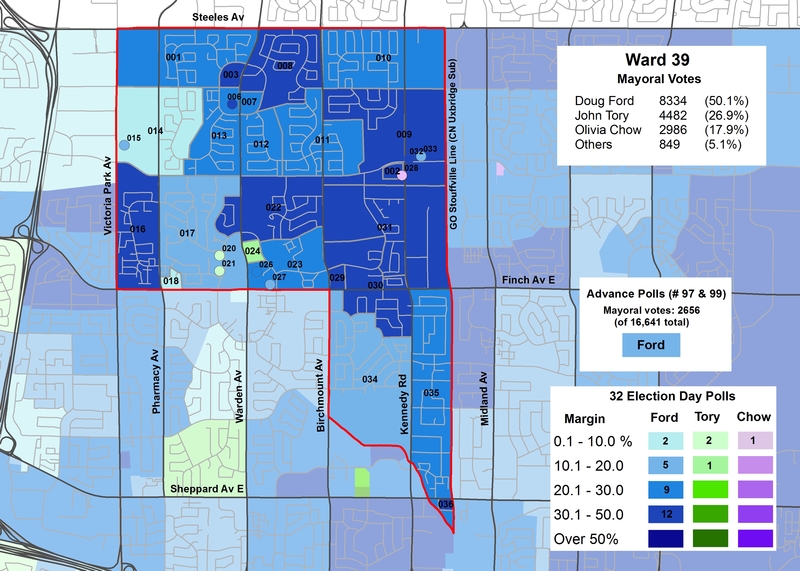 Like Ward 39, Doug Ford came in first place in all but four polls in Ward 40, with Tory taking three, and Chow one. 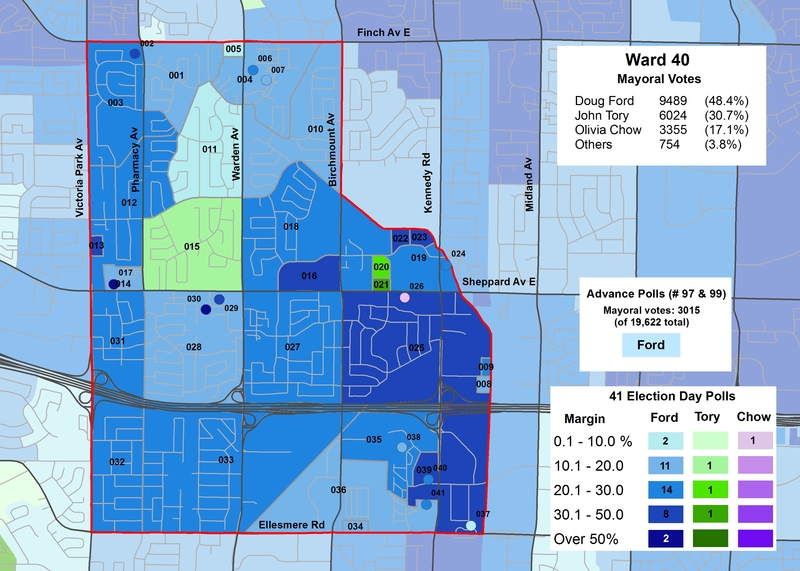 Tory did the best in Polls 020 and 021, the Shepherd Village retirement and assisted living community on Sheppard Avenue; he also came first in Poll 015, which doesn’t seem much different than its neighbouring Ford-voting subdivisions. Doug Ford did the best in Polls 014, a rental tower on Chichester Place and 030, an older condominum tower on Palmdale Place. Ward 39, represented since 2003 by accountant and former Catholic school board trustee Mike Del Grande, was an open race in 2014 with Del Grande’s announcement in February that he was not seeking re-election. On April Fool’s Day, April 1, Liberal MP Jim Karygiannis announced his resignation from federal politics to run for the council seat. Karygiannis’s announcement was a bit unusual. while it’s not rare for a sitting federal or provincial politician to run for municipal office, usually it’s to run for mayor (the newly elected mayor of Brampton, Linda Jeffrey, was a Liberal MPP and prominent cabinet minister when she resigned to run there; George Smitherman was another powerful provincial cabinet minister who ran for mayor of Toronto, but lost to Rob Ford in 2010). His claim was it was spend more time with family; speculation was that Liberal leader Justin Trudeau didn’t care for the veteran controversial and socially conservative MPP; the feeling was likely mutual. But with name recognition and a local political machine, Karygiannis pretty much had the advantage of any council incumbent, especially against relative unknowns Franco Ng and Cozette Giannini. While the Toronto Star endorsed Ng, NOW magazine endorsed Giannini, Karygiannis won in a landslide; taking 58.9% of the vote and all but three polls. Second-place Franco Ng netted only 18.1% of the vote (and came first in two polls), Giannini came in third with 9.8%. Fourth-place Derek Li came first in one poll, though this was a long-term medical institution with a small voting population. There was no contest in Ward 40, represented by councillor Norm Kelly, who won with an astounding 86% of the vote. But I’m certainly not complaining. Kelly is a long-term city councillor, but is also a historian, and taught history at Upper Canada College. He was first elected to municipal politics in 1974 as an alderman on Scarborough council. He was a Liberal MP between 1980 and 1984, losing to the Progressive Conservatives in the Mulroney landslide of 1984. After making an unsuccessful run for mayor of Scarborough in 1985, Kelly turned to real estate before returning to Scarborough council in 1994; he has been a Toronto councillor since the 1997 amalgamation. Kelly, a centre-right ally of mayors Lastman and Ford (between 2011 and 2014, Kelly voted with the mayor over 80% of the time), was named deputy mayor in August 2013. This was after Rob Ford’s first pick for deputy mayor, Doug Holyday, resigned after a by-election win in Etobicoke-Lakeshore for the Ontario Progressive Conservatives. (The losing Liberal candidate in that by-election, fellow Etobicoke councillor Peter Milczyn, won in the general election in the June 2014 general election). As Rob Ford’s personal scandals involving drug use and lewd behaviour deepened in 2013; council stripped Ford of most of his powers, transferring them to Kelly in November 2013. Kelly quickly re-established order and decorum to City Hall with humour and grace, and for that, politicians and observers of all political stripes were grateful. Even the lefty NOW magazine endorsed Kelly for re-election in 2014. 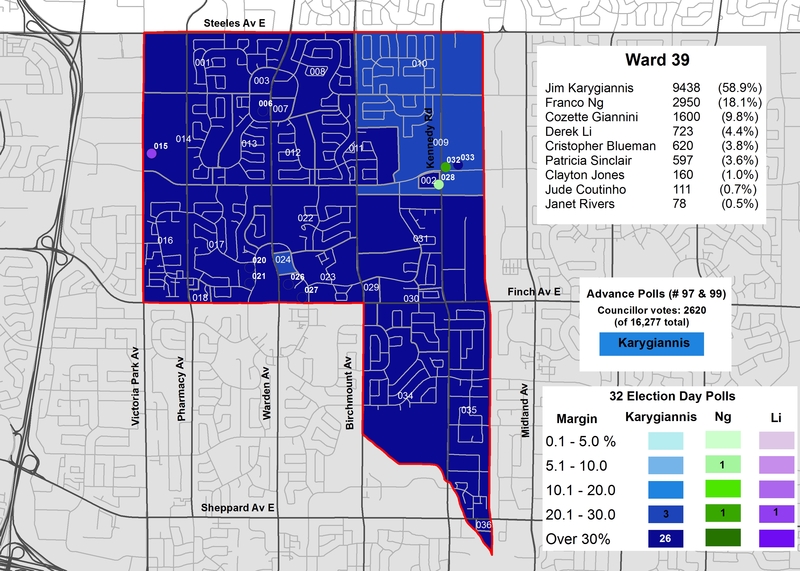 Given Kelly’s sweep of all polls in Ward 40, there was no need to create a map of the council race here. Post script: It’s also worth noting that Wards 39 and 40 were represented at the Toronto District School Board by Sam Sotiropoulos, a homophobic and transphobic individual, whose offenses are nicely summed up by Torontoist in its annual Heroes and Villains feature. Sotiropoulos lost to Manna Wong by 2067 votes. Still Sotiropoulos came in second place, and got 9,621 votes. I hope this can be chalked up to the incumbency factor and that many voters simply do not pay attention to school board politics. *It should be noted that Olivia Chow immigrated from Hong Kong and speaks Cantonese, many in Ward 39’s Chinese-Canadian community are immigrants from Mainland China and speak Mandarin. And of course, there are many considerations one makes when deciding who to vote for; as I mentioned earlier, I am not surprised to see Chow do so poorly in Agincourt. This entry was posted in Election, Maps and tagged 2014 Election, Scarborough, Ward 39, Ward 40. Bookmark the permalink.